As elsewhere, the local Y. M. C. A. in Middleborough is credited with fostering the early growth of basketball and the early history of basketball in Middleborough is, in large part, the story of the Y. 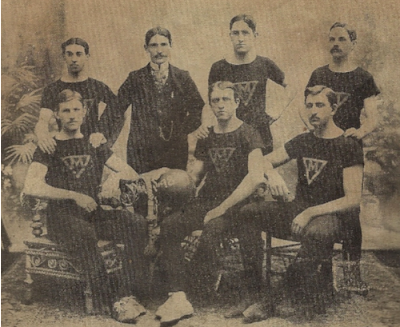 Created in 1891 at Springfield and introduced into Middleborough just a few years later, basketball had its first formally-organized local team in late 1896 when the Middleborough Y. M. C. A. formed a team to contest matches with other Ys within the region. 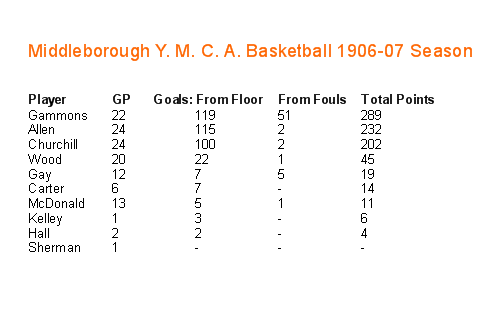 Between 1896 and 1909, the Middleborough Y. M. C. A. would dominate basketball in town, fielding the only teams until 1905 (when Middleborough High School formed a team) and 1909 (when the first independent team was established). The 1909-10 basketball season, in fact, marked a transition period, witnessing not only the formation of the first town team independent of the Y. M. C. A., but also the inauguration of Middleborough Town Hall as a new basketball venue, the beginning of construction of a new modern basketball gymnasium as part of the proposed Y. M. C. A. building on North Main Street and the rumblings of conflict between professional and amateur players. 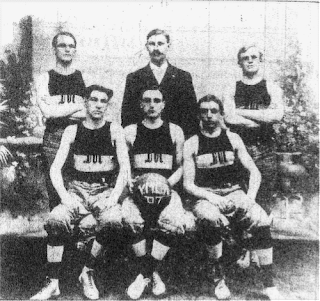 The Middleborough Y. M. C. A.’s role in the early evolution of basketball locally is not surprising given that the sport was developed in late 1891 and early 1892 by Dr. James Naismith, an instructor at the International Young Men’s Christian Association Training School (now Springfield College) at Springfield, Massachusetts. Charged by the director of the school, Luther Gulick, with keeping the students occupied and physically active during the winter, Naismith developed an active game which could be played in indoor gymnasiums by nailing two peach baskets ten feet high onto the wall on a 35 by 50 foot court. Players would shoot a soccer ball into the baskets in accordance with 13 written rules which Naismith pinned on a bulletin board. Because of the simple props, Naismith named the game “basket ball”. Because there were 18 students in the class, the original teams consisted of nine to a side (later reduced to five by the mid-1890s). Because the bottoms were not cut from the baskets, after each point, referees were required to climb a ladder to retrieve the ball and players would jump for it. (Not until 1906 were open nets and rims standard in the game). Additionally, in the absence of a shot clock, players tended to play at a leisurely pace. Prior to 1910, players were not permitted to move with the ball, so emphasis was placed upon passing with one or both hands. Because of these restrictions and limitations, early basketball was a much slower tempo game than at present, as indicated in part by surviving game scores which appear remarkably low by modern standards. (Poor shooting was also an obvious factor in such low scores). Spectators at the time frequently were critical of this aspect, often bored by the leisurely pace of cautious players. One news report concerning a game on January 14, 1905, between the Middleborough Y. M. C. A. first team and the South Ends of New Bedford at Middleborough criticized the match as “a basket ball game which many of the onlookers called ‘slow’”. Consequently, “fast players” received much praise and younger local players such as Mel Gammons and Chester Churchill who joined the Middleborough Y’s first team in the first decade of the 1900s became particularly noted (and appreciated) for their speed. Middleborough Y. M. C. A. Up to this time apparently little thought had been given to the provision of any indoor place, heated and lighted, for the purpose of conducting athletic competition, in fact, many of the games themselves were only beginning to receive attention. A new day was dawning (as it always is, if we can only see it) and with the advent of these games, interest in the Physical Department increased rapidly. Towards the end of securing a gymnasium, in July, 1893, the Middleborough Y. M. C. A. named T. S. Phinney, D. C. Wentworth and C. W. Corey a committee to investigate the possibility of hiring rooms in the American Building on South Main Street, including the six rooms on the second floor as well as the third floor hall. The second floor rooms were deemed as in need of repair by the Committee named to investigate the option, as well as “a thorough cleaning”. The third floor hall was more promising. “It seems to be in every respect well adapted to the use of a Gymnasium without hindering its use for entertainments and lectures.” Overall, the committee favored the premises, recording that “with but slight changes, and improvements, the rooms could seemingly be made well suited to our work.” The lease terms asked by the building’s owner, David Tucker, however, were high and were considered beyond the means of the Association. At its meeting on August 14, 1893, “after much general talk and discussion it was not generally considered best to” hire the rooms. In August, 1894, the Association was once more seeking larger quarters and set its sights upon the Bon Mode Building on Center Street “with a view to occupying the same or rooms for the Association.” Wentworth, Phinney and D. S. Surrey were named the committee to investigate the proposal. While no action was taken on these rooms, in November, 1894, the Association voted to pay Levi P. Thatcher “$400.00 a year for the upper floor of his new building fitted up as we want it.” Nothing came of this action, either. Consequently, the Association remained without space for a gymnasium, much to the dismay of basketball fans. Such people, however, took heart when in early 1895 the Middleboro Gazette announced that the Y. M. C. A. eventually would relocate to the Middleborough Savings Bank then under construction at the Four Corners. The Middleboro Y. M. C. A. management have decided upon an important change in location. They have secured the lease of the fine suite of rooms in the second story of the new Bank block, comprising the corner room and two connecting rooms, and an office facing Main street. This will be one of the handsomest suite of rooms I town and will undoubtedly give the association a better standing and opportunity in town. The announcement, however, proved premature. A year later in early 1896 when the Y formally applied to the Middleborough Savings Bank “for the use of a room for a Gymnasium” in the bank’s new building at the Four Corners, the Bank tabled the request, prompting the following response from the Y. To the Directors of the Middleboro’ Savings Bank. At a meeting of the Board of Directors of the Young Men’s Christian Association Dec. 27. ’95. it was voted to occupy the rooms in the Bank Building on Feb. 1. This was with the understanding on our part that we could rent a part of the upper floor for a gymnasium. We understand that you laid on the table the proposition to rent the Association the gymnasium. We are very anxious to occupy the rooms Feb. 1 but believe that the question of renting the gymnasium and price of the same should be decided upon before we sign a lease. We therefore submit the following proposition that we occupy the rooms Feb. 1 guaranteeing the rent of the same monthly and agree to sign a lease for the whole, when an agreement regarding the gymnasium and price has been made. The Bank, once more tabled the Association’s proposal, whereupon the Y rescinded its voted of December, 1895, to engage rooms in the building. In May, 1896, the organization named a committee “to see what can be done about a Gymnasium.” The committee reported back on July 6, that pledges be solicited for the construction of a gymnasium including a “plan for gymnasium membership.” The group believed that it could attract new members whose dues would help provide for the construction of a new gymnasium. By late July, 26 individuals indicated that they would join the YMCA if a gymnasium were provided and the Association voted “that when we get 75 new names pledged for full membership to proceed to build a gymnasium.” By late August, 38 names were pledged and the Association named a committee of two to visit the Brockton YMCA in order to gain information “in regard to light gymnasium.” Despite the progress made in this area, the Association voted on August 28, 1896, “not to start a gymnasium in the hall under the present conditions.” State Secretary Armstrong, however, was present at the meeting of September 11, and urged the local Y to move forward with plans for a gymnasium, and he offered to send a representative to assist the local group until the necessary funds had been raised. Subsequent to Armstrong’s urging, the Middleborough Y. M. C. A.’s attention was drawn once more towards the Thatcher Block on Center Street at the corner of Thatcher’s Row which had a number of small rooms as well as a meeting hall formerly used by the Sons of Temperance on the second floor. The Y. M. C. A. ultimately offered Mr. Thatcher $50 annual rent for the use of the facilities. Thatcher. himself, proposed the possibility of a separate gymnasium addition, though the two separate contractors he had review the plan both felt the proposal was not feasible. Mr. Thatcher offered to give half enough to build the piece if the association would build it and take his part out of the rent, at the rate of Fifty Dollars a year. He also offered to build a building for gym. on the ground or have us use the hall for a gym and have the room now occupied by the Democrat Club for a game room. Voted that Mr. Shaw see if we can have room for baths and dressing room used by Dem. Club and use hall for gymnasium…. In October, 1896, the Association voted to hire the large hall from Thatcher for use as a gymnasium as well as the small rooms (at $2 a month) and to convert them for baths, and to acquire “gymnasium apparatus” from the state organization and Athletic Club. 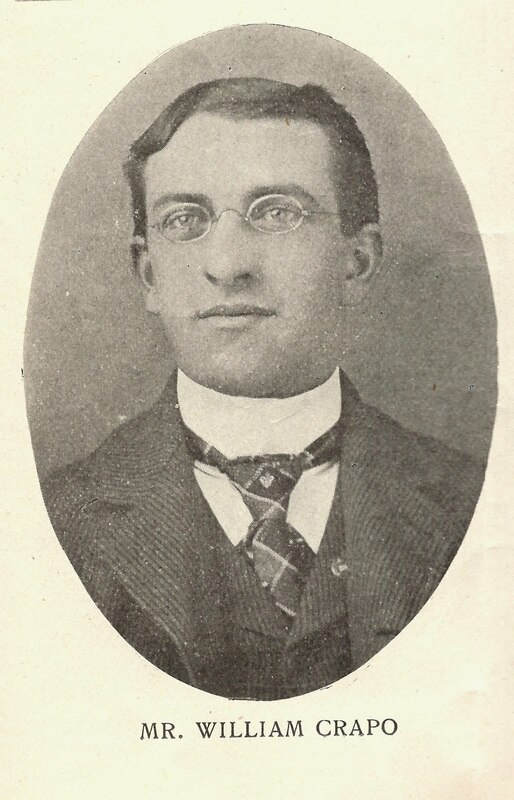 The following month, a permanent Gymnasium Committee was named and Arthur H. Thompson became the Association’s first Physical Director. 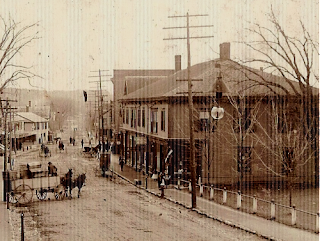 Yet, despite the limited size of the space and the demand for a location that would permit “heavier work”, it was there on Center Street that basketball was first formally played in Middleborough and it was at this time that the first basketball team was organized by the Y. M. C. A. 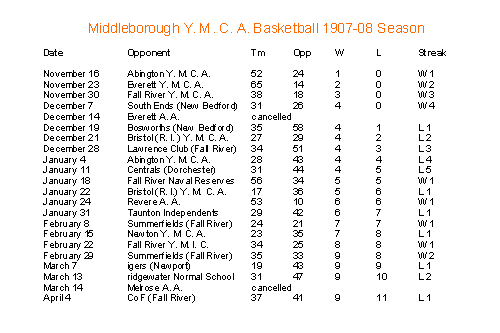 According to Will Crapo, basketball had been played in Middleborough prior to this time, though the Y team appears to have been the first formal team organized. In addition to Crapo, the team’s original members included Albion (“Al”) W. Merritt, George L. Thomas, Charles A. Sherman, and William (“Will”) C. Phinney. The first game played with an out-of-town team was with the Taunton Y. M. C. A. in the local Y. M. C. A. gymnasium. The rules of the game at that time, while not prohibiting each player to move from an imaginary circle while playing, each player was expected to keep within a certain territory. The rules allowed much more roughness than is allowed in amateur rules today. To illustrate this: the first game played with the Taunton team was won by a player who threw the winning goal while lying on his back on the floor, he having been knocked there by one of the opposing players. Holding and pushing were allowed more at that time than today. the gymnasium is unquestionably the most popular part of the association work to young men in general, and is a tremendous force in getting men interested. This, together with the social and educational work, constitute the attractive side which enable is to reach men. This being so, emphasis should without doubt be placed upon it in order to get men in, as well as to do its specified work in ministering to their physical needs. Sometimes the good work of the physical department in building up strong healthy men is overlooked. When it is considered that physical health plays an important part in the development of character, it can be seen how important it is for the young men themselves, and for the furthering of the highest aim. Men working inside generally lack the exercise necessary for perfect health, and this need is met in the gymnasium work. For these reasons much will be done to interest men in the gymnasium classes and other features in this connection. …Saturday nights will be devoted to basket-ball, and some spare time on Monday and Friday nights also. A basket-ball team will be organized to represent the association. Y. M. C. A. basketball was not only to provide the young men within the community an opportunity for physical work, but also to act as an incentive in attracting new members to the organization. It is not surprising then that when the local organization formed a “Committee of Forty on the Warpath for New Members Before Oct. 1” sometime in the mid or late 1890s that players from the Y. M. C. A. team – Sherman, Merritt, Crapo, and Phinney – were prominent among its members. No doubt, the goal was for them to attract athletically-minded new members from among the community. To accommodate the number of individuals desiring to play basketball, the Y. M. C. A. sponsored a number of teams. The first or senior team was the strongest team and was typically comprised of young men who either had tried out and been named to the team or who had been drawn as the best players from a Y. M. C. A. league of teams. For instance, during the 1900-01 season, the local Y sponsored four teams from which the strongest players were to be taken to form the first team which would compete against other local Y. M. C. A. teams. A second or junior team was also sponsored each year for younger and less experienced players. These junior teams helped develop younger players and gave depth to the bench. In time, many of these junior players would find their way onto the first team, helping provide greater consistency from one season to the next for the local organization. The 1901-02 junior team featured such future Middleborough Y. M. C. A. and High School standouts as Melvern Gammons, Lester Allen, Kenneth Childs and Johnnie Morrison, and in 1903-04, the junior team known as the Black Knights were noticeable for their prominence. Gammons (as captain) along with Chester Churchill (as manager) helped lead the team to a 10 and 4 record competing against teams such as the New Bedford Eagles, Taunton Quakers, Brockton Monitors, Brockton Mohawks, Whitman Hustlers, Brockton High School, Ames High School (North Easton), and Taunton High School. Middleborough Y teams tended to be very young, composed largely of new adherents to the game. In 1906 it was remarked that “it is a noticeable fact that the players who comprise the [first] team are all young men, not one of the regular team having passed the 25th birthday, while some are not over 17.” This factor also contributed to the longevity of some local players’ careers, most playing for multiple seasons and a number of them playing for nearly a decade. Providing a degree of formal organization for the local sport was the Amateur Athletic Union (A. A. U.) which had been founded in 1888 to establish standards and uniformity in amateur athletics. The Middleborough Y. M. C. A. teams were registered with the organization which helped promote a higher level of play among its members. Throughout the early period, basketball was noted for its occasional roughness, and Middleborough teams were no exception. News reports at the time typically mentioned the “cleanliness” of the game, so lacking was it from the sport at times. One game between the Middleborough and Brockton Y. M. C. A. teams on February 9, 1901, was described as “one of the cleanest … of the year”, while contrarily the match between Middleborough and Co. E of New Bedford on December 31, 1904, was noted as “the roughest of the season” when a fight was narrowly averted during the second half. During the opening game of the 1906-07 season, Chester Churchill of the Middleborough Y team and Harrison of the New Bedford South Ends were ejected “on account of alleged slugging.” Numerous game summaries from throughout the period would make note of rough play, unintentional fouls and ejected players and the fact that forward Lester Allen of Middleborough was nicknamed “Bruiser” is somewhat indicative of the nature of the game at the time. During the period, a number of Middleborough games were noted when “faces mixed with fists”. On January 23, 1909, at a meeting between the local Y. M. C. A. team and the Bosworths of New Bedford before a crowd of 300 spectators, “the game ended in a lively set-to, in which blows were exchanged, one woman fainted, and officer Fred A. Thomas rushed on to the floor to separate the belligerent spectators.” Not surprisingly, the fracas was a result of a disputed call. There was a question of a decision, and players on the Middleboro team which was affected, questioned its legality. New Bedford players were ready to debate it. In the heat of discussion blows were exchanged. The spectators then took a hand and rushed on to the floor and some of the visitors were used pretty roughly. Officer Fred A. Thomas appeared on the scene as the crowd made for the centre and tried to stop the trouble. Others who like clean sport also took a hand and finally the warring factions were separated. When the game stopped with six minutes to play the Bosworths led, 23 to 18, according to the Middleboro scorekeeper’s count. The crowd was at fever pitch, and it was deemed inadvisable to continue the game, so it was called. The Bosworths claimed the forfeited game to them, but Middleboro combated this. Arguments continued in the rooms, and on the street until the visiting team took their special car home. Just three weeks later, on February 12, a nearly identical incident occurred when with only two minutes remaining to play, a game between the local Y. M. C. A. team and the Wamsutta team of New Bedford had to be called after scuffling between opposing players threatened to erupt into a general melee at the Middleborough gymnasium. The trouble started last night in the second half when [Elmer] Gay [of Middleborough] and Murphy [of New Bedford] had a mixup, but that was checked. With the score 39 to 25 in favor of the home team, and only two minutes to play, Murphy, who had figured in the first fight, had an encounter with Allen and the crowd rushed onto the floor. After much trouble the floor was cleared, but the game did not continue. The roughness of the sport, unintended by Naismith when he devised the game, contributed to its falling somewhat from favor among some Y. M. C. A. proponents who disapproved of the “rough and tumble” nature of the game at the time. In 1909, “The Commentator”, an editorial column published regularly in the Middleboro Gazette at that time vocalized this sentiment. The Commentator’s patronage having been earnestly sought on numerous occasions in behalf of the basket ball games and similar athletic exhibitions frequently held in the gymnasium of the local Y. M. C. A., the spirit moved him, the other evening, to yield to the often repeated request for moral and financial support to the extent of attending a game. It was not exactly the first basket ball game that he had ever witnessed, but the previous occasions were so far back that possibly his recollection is somewhat at fault – his impression is, however, that either the natural concomitants of the game have been greatly increased, or that the game the other evening was an exception to the general rule. Now athletic sports are not sewing bees, nor is it in any way desirable that the virile and lusty enthusiasm which finds vent in these contests should be checked. But really it does not seem necessary that a game between young men representing associations which are founded for a distinctly moral or even religious purpose should wind up in a free fight. It adds nothing to the pleasure of the spectators, and contributes nothing to the pleasure of the game, as such, to the participants. There is a distinct and separate branch of athletics, sometimes dignified by the appellation of “the manly art of self defense,” which out to be substituted for basket ball by those who really feel that they must have a row. If we are to have basket ball, let us have basket ball; if we are to have pugilistic encounters, let us make a business of it; but let us not make one over into the other while the spectators wait. The local Y. M. C. A.’s general secretary, Walter J. Carter took umbrage at the Gazette’s comments, mistakenly perceiving them as an attack upon the organization rather than a well-warranted critique of the sport’s increasing roughness and the local organization’s failure to adopt a tougher stance against those players who failed to restrain themselves. The Young Men’s Christian Association stands for clean sports….The association is however made up of individuals and each individual is a human being and is subject to more or less of the imperfections of the human. We make mistakes, but where is the man or the organization that does not? Due to space limitations within the existing gym in Association Hall, in September, 1897, the Middleborough Y. M. C. A. once more considered the possibility of constructing a gymnasium addition onto the Thatcher Block, and a committee was named to enquire of Mr. Thatcher as to his intentions in that direction. Thatcher “reported that he could not put on [an] addition for [a] gym.” By late 1897, the Association began to consider space in the former Peirce Academy building on Center Street for use as a gymnasium, though the committee named to look into the possibility advised against it in early 1898. In March, 1898, the Association yet again toyed with the idea of relocating to the former Academy Building, but in April declined the contract drawn by the prudential committee of the Central Baptist Society which owned the property. When basketball was in its prime in these quarters there were a few rows of seats for the spectators around the playing area, with a wire netting separating them from the playing space, and sparing them occasional conks on the head with the tossed ball. When purchase of the building from the Central Baptist Society seemed almost certain in 1908, the Y proposed “sinking the floor of the gymnasium to give more space” and creating galleries on either side of the court to permit more spectators. Ultimately the plan was irrelevant, the Y. M. C. A. opting to construct a new building on North Main Street in 1912. During the early period of basketball’s development in Middleborough, the community had a number of noted players who demonstrated their skill in both the Thatcher Block and Peirce Academy gymnasiums. William (“Will”) C. Phinney, one of the original players on the 1896 squad, was later described as a “centre, who was tall and exceptionally strong”. Though Phinney played left guard, as well, his height no doubt made him ideal for the team’s center. Though he injured his ankle while playing basketball in 1909, Phinney had previously retired from local Y. M. C. A. basketball a number of years earlier. Phinney continued his work with the local Y as a member of the Physical Committee. Center Albion (“Al”) W. Merritt “was probably the best long shot thrower the game has ever seen in Middleboro”, a claim made in 1954 long after Merritt had passed from the scene. Joining the first Y. M. C. A. team in 1896, Merritt played through the late 1890s and retired from the game in the early 1900s, later operating the Ideal Lunch counter in Middleborough. Charles A. Sherman was a member of the original 1896 team, and he last played as a regular starter in the 1904-05 season. During his later career in local basketball, Sherman was more noted as a manager and among the teams he managed were the Middleborough Y. M. C. A. teams of 1905-06 and 1906-07. Not surprisingly, Sherman also served on the local Y. M. C. A. committee which was devoted to the organization’s athletic work. Sherman later developed a keen interest in motorcycles which he began to repair and sell. By 1910, he was acting as an agent for both Thor and Minneapolis motorcycles locally. William ("Will") H. Crapo, like Sherman, was on the original Y. M. C. A. team, but retired from active play sometime before 1900. After that date, he was more recognized for the various support positions he assumed within the local Y basketball organization. Crapo served as scorer and timekeeper for many Y. M. C. A. games, including one disputed game in early 1903, as well as officiating numerous games as referee. He was a mail carrier in Middleborough. George L. Thomas, the last member of the original 1896 squad, played forward and like Crapo, retired from the game early in the period. Thomas later worked as a contractor, initially as a partner in Thomas & Benn, but would maintain his connection with the local Y as a member of its physical committee. Albert (“Bert”) Keyes was recalled by Chester Churchill as “the best guard, under the old rules, that he ever saw play”. Keyes originally played left guard but was later moved to forward. In the spring of 1904, he was succeeded on the team by Mel Gammons at left forward. Like other early players, Keyes would continue his work promoting local Y. M. C. A. basketball as a member of the Middleborough organization’s Physical Committee. Johnnie Morrison (right forward), though small in stature, was a scrappy player. During the mid-March 1903 junior team game against Somerville, Morrison was substituted in the second half, eliciting the following commentary from the Brockton Enterprise’s correspondent: "In the second period little Johnnie Morrison, who can tip the scales at 65 pounds, was put on the floor in order to give them a shot, and an experienced played was withdrawn. Johnnie played a star game, drawing considerable applause." In 1903, Morrison was moved up to the Y. M. C. A. first team, playing through spring 1904 when Chester Churchill was slotted into the position of right forward. Following that time, Morrison alternated between starts on the second and first Y. M. C. A. teams. 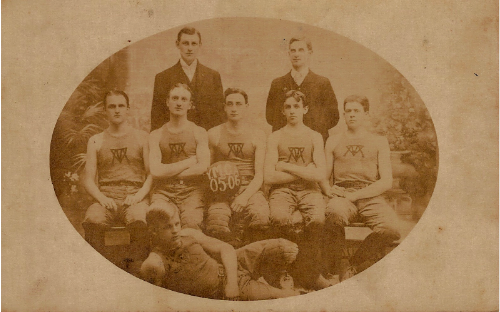 As early as 1900 Elmer F. Gay (left guard) was prominent within the local Y. M. C. A. basketball organization, captaining one of the league teams during the 1900-01 season. Gay was a noted player throughout the early 1900s, and started in many games throughout the decade. He would later serve on the local Y's Physical Committee. Dudley ("Dud") Pratt became a starter at center on the Y. M. C. A. team during the spring of 1903, but played only intermittently. (During the 1905-06 season, he started in only 4 games). Lester Allen (right guard) was a stand out player in the first decade of the 20th century, but often played in the shadow of Mel Gammons and Chester Churchill. Like many local players of the period, Allen gained notoriety as a member of the Y. M. C. A. junior teams before advancing to the first team which he joined for the 1905-06 season, starting in 6 of 18 games. Allen was also one of the members of the 1905 Middleborough High School squad along with Mel Gammons and Harold S. Wood. By 1906-07, Allen was starting regularly for the Y's first team and, in fact, played in all their games that season during which he was the second leading scorer with 232 points. Allen remained a pivotal player throughout much of the period, and the success of the team at this team is due in part to him. Left guard Harold S. Wood was one of the members of the 1905 Middleborough High School team who became prominent on the Y. M. C. A. first team as a starter the following season. Wood was a reliable player who remained with the Y. M. C. A. team for a number of seasons before moving on to the Middleborough A. A. team for 1909-10. Among the most notable of all the players of the period, however, was D[avid] Melvern (“Mel”) Gammons. Though he was an all-round athlete playing both football and baseball for Middleborough High School, it was in basketball that Gammons excelled. Gammons first came to prominence as a member of the Middleborough Y. M. C. A. team, playing left forward, before joining the Middleborough High School team. During the 1903-04 season, Gammons, like Churchill, was a member of the local Y. M. C. A.’s Black Knights team and during the season started in at least one game as a member of the Y. M. C. A.’s first team against St. Martin’s on March 26, 1904. By the 1904-05 season, Gammons was starting as a regular member of the first team and the following season he was the top scorer with 226 points from the field and 18 free throws. Gammons was typically the leading scorer for Middleborough in each game in which he played, and it was said of him as early as 1904 that “Gammons is the best goal-getter of the team, having made as many as 10 baskets from the floor in a game. He rarely misses a goal thrown on a foul.” Gammons served as captain of the Y. M. C. A. team in 1906-07. Gammons was also instrumental in the formation and development of a team for Middleborough High School in 1905. Though he may have attended Dean Academy for a time, Gammons completed his education at Middleborough High School where in 1909 he was the leading scorer with 226 points from the floor and 23 foul shots. In his later career at Middleborough, Gammons alternated between center and forward. Gammons was also noteworthy among Middleborough players as he was the first local basketball player who was alleged to have violated his amateur status. Because of Gammons' apparent skill, he was easily able to move into both coaching and officiating while still playing. On January 22, 1910, Gammons acted as referee at the Bridgewater Normal School between that school’s team and one from Taunton High School. “A dispute arose over a decision, Taunton taking exceptions. Some talk was made then … about [Gammons] receiving money for his services.” The following Wednesday, when Middleborough High School met Taunton High School, Gammons was ruled out of the game on the grounds of being a professional. While Gammons admitted to receiving expense money (an action which would fail to compromise his amateur status), the action by Taunton was regarded as a retaliatory act in response to Gammons’ call not having gone its way the previous week. This is to certify that Melvern Gammons of Middleboro has never received a cent from me for coaching or refereeing, except money paid for legitimate expenses. Any charged of professionalism against Mr. Gammons because of his relations with Bridgewater Normal are false. Because of the dispute, manager Neal R. O’Hara of the Middleborough squad cancelled the team’s two remaining games with Taunton High School “owing to the action of the basket-ball team of that institution regarding Melvern Gammons’ eligibility on the local High school basket ball team.” Fortunately for Gammons, the incident blew over quickly without further damage to his reputation. In 1909-10 when he was "recognized as one of the fastest basket-ball players in this section", Gammons helped form the Middleborough A. A. team, Middleborough's first team independent of the Y. M. C. A. and not associated with Middleborough High School. In November, 1910, Gammons announced his signing with the Randolph team of the Bay State Professional Basketball League, and a year later in 1911 he helped form the College Five, a team composed of Middleborough college students including Gammons, Keedwell, Witbeck, Marshall, Harriman and J. Stearns Cushing. Other players of the era included Ralph Kelly, Rodney McDonald, Stearns Cushing, Morton Marshall, George Carter, Ralph Mendall, Daniel Besse, Fred A. Thomas, Fred Logan, Al Sparrow, Kenneth Childs, and Gordon Shurtleff. 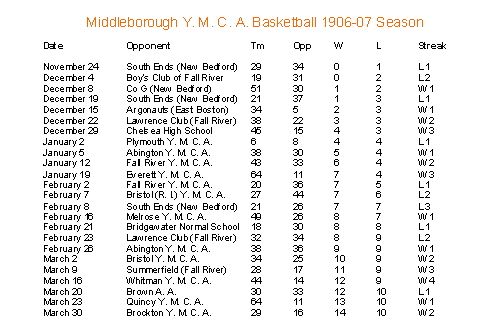 Early basketball in Middleborough was dominated by the first team of the local Y. M. C. A. and not until the 1909-10 season when the Middleboro A. A. team was formed was there an independent team (that is, a team not sponsored by the Y. M. C. A.). 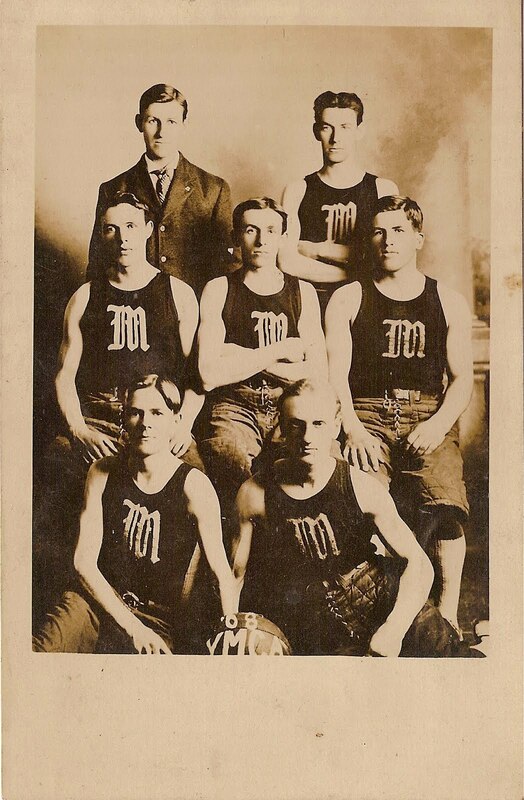 For 13 years, the Y. M. C. A.’s teams had the exclusive attention of Middleborough basketball fans, though the formation of teams at Middleborough High School beginning in 1905 began to contribute to the broadening of the sport beyond the Y. Information regarding the earliest teams fielded in Middleborough remains scant, and game summaries, season records, and statistical information has to be recreated, and is not always complete or, in many cases, is absent. Season records, individual player statistics, even dates, frequently can no longer be known with certainty or known at all. The following season summaries for the period in question, however, provide a glimpse into what basketball in Middleborough was like during this period. Virtually nothing is currently known regarding the first four seasons of Y. M. C. A. basketball in Middleborough though undoubtedly information exists buried in the columns of decaying regional newspapers of the period. The inaugural season was 1896 when the Y. M. C. A. first established a team comprised of Albion W. Merritt, George L. Thomas, Charles A. Sherman, William H. Crapo, and Will C. Phinney. The members of this original team would remain prominent in Middleborough basketball circles through the early 1900s, either as players or in the capacity of managers, scorers, referees or timekeepers. Local basketball “enthusiasts” met on October 24, 1900, “and made preliminary arrangements for the opening of the season. There was an abundance of material for the teams, both of old players and new ones, and much interest is being aroused. One evening each week will be devoted to practice.” The Y. M. C. A. proposed a league of several teams from which the best players would be selected to comprise the organization’s first team – the team which would play outside teams. Phinney was named captain and Crapo manager. Monday was the day set aside for practice in the local gymnasium. Principal members of the team this season included Phinney at center, Fred A. Thomas right forward, Gilkey left forward, Frank Thomas right guard and Bert Keyes left guard, although others playing included J. Sparrow and S. Stevens. Among the outside teams met in competition were Y. M. C. A. squads from New Bedford (December 19 16-5 win; February 16 15-31 loss), Whitman (December 24; April 3 38-2 win), Fall River (December 29 15-13 win; January 12 16-26 loss), Taunton (January 30 28-3 win) and Brockton (February 5 9-7 win) as well as the Quessetts from South Easton (January 16 42-4 win), Battery I from Brockton and Thayer Academy. Y. M. C. A. 2d – Pierce rf, Sparrow lf, Gilkey c, Gay rg, Beaton (Capt.) lg. Parlor Grate – Gallond (Capt.) rf, Swift lf, Minot c, Bailey rg, Bump lg. The summary: Y. M. C. A. 34, Parlor Grate 8. Goals from the field – Pierce 6, Sparrow 6, Gilkey 2, Gay 3, Swift 2, Bailey. Goals on fouls – Gallond 2. Fouls called – Sparrow, Hilkey 2, Gallond 2, Bailey 2, Swift. Referee and umpire – A. E. Roberts and Will Crapo. Timer – W. Phinney. Scorer – Frank Woodward. Time – 20-minute periods. The team named for the 1901-02 season consisted of forwards Fred A. Thomas and Oliver Lemaire, center A. W. Merritt, and guards Leslie C. Brock, Frank Thomas and George L. Thomas who alternated in the line-up. In addition to this first team, the local Y. M. C. A. organized a league of four teams captained by Thomas, Elmer F. Gay, Merritt and J. Sparrow. H. W. Swift was selected as the manager of the league which was to compete on Wednesday evenings in the Y. M. C. A. gymnasium. Besides providing recreational opportunities to a wider group of members and entertainment for the sporting public, the league no doubt provided valuable practice for the first team. Yet another feature of the season was a basketball game between married and single members, a game which appears to have been established as an annual tradition a few years prior to 1902. The annual basket-ball game between the married and single men of the Y. M. C. A. took place last evening and resulted in the defeat of the married men, 38 to 36. For the single men Sparrow and Pierce put up a good game. There was a large attendance. The line-up was: Single men, Sparrow rf, Pierce lf, Norris c, Bettencourt rb, Gay lb; married, Thomas rf, Mendall lf, Churbuck c, Phinney rb, Pratt lb. Work by the Y. M. C. A. team resumed in late October, 1902, but some were skeptical of the prospects for the season given the fact that a number of experienced players including Brock and Lemaire would not be returning. “A number of the players who brought glory to the team last year are unable to play, and it is hardly expected that as fast a team as last season’s can be gotten out of the present players, who are less experienced.” Nevertheless, in what was possibly the team’s opening game against the Boston Y. M. C. A.’s second team on December 20, 1902, Middleborough defeated their opponents, 28-13. The lineup was Thomas (rf), Bert Keyes (lf), Merrit (c), Phinney (rg) and Gay (lg). One of the hardest fought games of the season was the New Year’s Eve game against the team from Brockton High School on December 31, 1902. Despite the Middleborough team’s growing dominance of its home court (in 1905-06 the team would remain undefeated at home), the Brockton students were able to take the win, largely by shutting down the Middleborough offense. The B. H. S. C. basketball team scored another success last night in the Middleboro Y. M. C. A. gymnasium. This is the hardest gymnasium on the circuit in which to take a game from the home team. Close defense work did it. The visitors allowed the home team but two field goals, and but two men in the visiting team scored. Crowell was king, and he dropped in three, with the aid of passing. G. S. Pitcher made his points on foul goals, and Gay was even more fortunate for the home team. The Brockton boys made nine fouls to seven by the home team. The feeding of the ball by G. S. Pitcher was a feature. 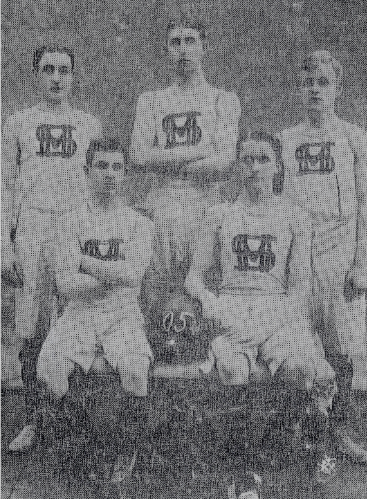 The mainstays of the team through the course of the season remained Thomas, Phinney, Keyes, “Dud” Pratt and Merritt who alternated at center, and Gay. Teams played in the spring of 1903 included the Y. M. C. A. team from New Bedford (23-12 win). The game against the Whitman Y. M. C. A. in late March or early April, was tightly contested and ultimately won by Middleborough, 19 to 17. Not surprisingly, given the roughness of the match, it was conspicuous for the large number of fouls. There were all kinds of little rows here and there. During the last few minutes of the play Peterson of Whitman tried to change the map of ‘Dud’ Pratt’s face. He got Pratt up against the door and was just getting ready to punch him when Pratt got after him and let him see how they do it in Middleboro. Innumerable fouls were called throughout the game. Merritt of Middleboro got seven goals on fouls, and Reid got two, and Peterson of the visitors got one, each on fouls. Merritt and Phinney got two each from the floor, and Keyes and Thomas got one each. Middleborough may have in fact taken some pointers from the Fall River team for their March, 1903, game against the Bangor, Maine, Y. M. C. A. team was noted for good pass work. Unfortunately, the skill demonstrated by both teams during the game was lost in the confusion which marred the end of the game due to an error made by timekeeper Will Crapo of Middleborough. The timekeeper thought that the last half was to be a 20-minute period instead of a 15-minute period, and he let the time run over a little. The result was that the Middleboro increased its lead from two points ahead of Bangor to four points ahead. Bangor made a kick, claiming it to be a tie, and wanted to play it off. The Middleboro boys, feeling that they were ahead anyway, would not play, and this left Bangor disgruntled. (It is not clear why Crapo made the mistake, as Middleborough Y games throughout the 1902-03 season all appear to have been conducted with two 15-minute halves, the original periods established by Naismith in 1891. Admittedly, earlier seasons had included 20-minute halves. For the 1903-04 season, Middleborough seems to have permanently adopted 20-minute halves, the present standard for college basketball). In contrast, Middleborough’s game against the St. Martin’s team of New Bedford in early April was “slow and generally uninteresting”, and was probably a throwback to earlier games and their more leisurely pace. It is curious, however, why the game proved lackluster as it remained close throughout and Middleborough’s 33-31 win was decided only in overtime. As in previous years, the Middleborough Y. M. C. A. in 1902-03 sponsored a junior or second team, partially in order to build depth. Middleborough’s second team of 1902-03, as would be the case in other years, was remarkably strong, though the players were very young and relatively new to the sport. The youths from Somerville who went to Middleboro to play the Y. M. C. A. second basketball team went home yesterday thinking they met the real thing. They were boosted all over the floor by the diminutive Middleboro team. In the first period Middleboro got four goals from the field and one on a foul, while all the visitors got was two goals on fouls. …. Middleboro got 10 goals from the field in the second period to Somerville’s three and two on fouls. Gay, Pierce and Howes showed up well for Middleboro, and Courtney and Nangle played all the game for the Somervilles. Pierce and Howes of Middleboro got five goals each. Maxim and Caswell of Middleboro put up good aggressive work. Additional teams appear also to have been sponsored by the Middleborough Y. M. C. A., organized on a vocational basis. In April, the Farmers defeated the Students, 22 to 19, while the Shoemakers and the Clerks later contested a game. Y. M. C. A. season were Phinney, Pratt, Thomas, Gay and Keyes. Johnnie Morrison moved up from the junior team, and Logan joined the squad as well. Sparrow played during the year, too. Despite the presence of a number of experienced players, the season would be noted as a “building” year as the team transitioned from older experienced players to talented, though inexperienced, youngsters like Mel Gammons and Chester Churchill over the course of the season. Initially this process was not without challenge. The opening game was likely the contest between the Middleborough Y and the Victors of New Bedford on December 19, 1903. The game was “exciting”, despite the 22-27 loss for the locals. Later in the month, the Middleborough team defeated the Mohawks of Brockton, 18 to 9, but succumbed to the Brockton High School team the day after Christmas 12 to 23. On January 23, 1904, the locals beat the Taunton A. A. team in “an interesting game, 25 to 12”. The Middleborough Y’s second team, known as the Black Knights, was strong, featuring Lester Allen, Kenneth Childs, Harold Wood and Mel Gammons, all who would later go on to start for the local Y. M. C. A. first team, Middleborough High School, or both. In January, 1904, the second team “easily defeated” the team from the New Bedford Grammar School with a lopsided 21-0 decision. Allen proved the local standout in the game. On January 22, 1904, the Knights beat the Taunton High School team, 15 to 8 with Gammons scoring 6 points. During the spring, the Y. M. C. A.’s first team recorded wins against the New Bedford Eagles (41-6) with losses to Whitman Y. M. C. A. (20-26), New Bedford Naval Brigade (12-34), Oliver Ames High School (20-21), St. Martin’s of New Bedford (24-31) and the Lawrence Club of Fall River (24-37). The string of losses was due to the inexperience of the team, the composition of which had changed by this time. While Logan, Sparrow and Phinney remained, Mel Gammons and Chester Churchill, both skilled but young players on the Y’s junior team, had moved up to start as the first team’s forwards, while still playing on the junior team. The 1904-05 Y. M. C. A. first team was dominated by new comers - forwards Mel Gammons and Chester Churchill who had started at the end of the previous season. Charles Sherman of the original 1896 team started at right guard. Dud Pratt returned at center, while Thomas rounded out the quintet at left guard. Will Phinney, still active, started in a number of games, as well. The 1904-05 team faced a mixed group of opponents as other communities began formally organizing basketball teams outside the purview of the Y. M. C. A. The inexperienced New Bedford South Ends were criticized by the Middleboro Gazette in 1905 for their poor play which the newspaper attributed to lack of practice. “The visitors were apparently boys without a home for basket ball playing, giving evidence of having rehearsed in some neighboring barn, and they seemed dazed in the [Middleborough] hall.” With time, the South Ends would sharpen their abilities and offer stiff competition for the Middleborough teams over the ensuing years. Similarly, the novice Marion team which was defeated 34-9 on January 21, 1905, was noted as “recently organized and needs practice”. The January 7, 1905, game between Middleborough and the Fall River Tigers was perhaps the most competitive match-up with Middleborough eking out a two point win, 27-25. The Brockton Enterprise described the encounter as the “most exciting basket-ball game of the season. During the last eight minutes of play the game was a tie and the excitement was intense.” Like many Fall River teams, the Tigers were noted for their passing game and the lack of mention in this regard for Middleborough probably indicates that the locals were probably still struggling with this aspect of their teamwork. Churchill led the Middleborough scoring that evening. Demonstrating their dominance of the sport locally as players, Churchill and Gammons were Middleborough’s only scorers in the team’s 25-10 win on January 14 over the South Ends of New Bedford. Churchill hit six from the floor with Gammons contributing another four as well as five free throws. Following an easy win (34-9) over an inexperienced Marion team on January 21, the local team dropped two to faster teams from Fall River and Boston. On January 28, Middleborough lost a closely contested match 19-21 to the St. Joseph team of Fall River, the swiftest team seen that winter at Middleborough. The locals were hampered by the absence of Gammons and “played a crippled team.” A week following on February 4, the loss of both Gammons and Churchill was felt against the Boston Y. M. C. A. which “proved too fast”, and the Middleborough team lost 6-30. Gammons returned for the close 11-13 loss which Middleborough experienced at the hands of the Taunton Y. M. C. A. on February 11. The game remained tight throughout and was decided only in the last minutes. The February 18 match-up featured an interesting contest between the Middleborough Y. M. C. A. and Middleborough High School, likely the first time two Middleborough teams faced one another in formal play. Gammons, Allen, Childs, Wood and Johnson played for the high school against their Y. M. C. A. teammates Churchill, Sherman, White and the Thomases. The Y won the outing by a score of 37-10. For the game, Gammons switched to right forward, demonstrating his versatility. Another intriguing match-up occurred the following week when the local Y’s first and second teams met. Somewhat embarrassingly, the second team of forwards Morrison and Alden, center Logan and guards Gay and Sparrow beat the first team, including Gammons and Churchill, 16-14. 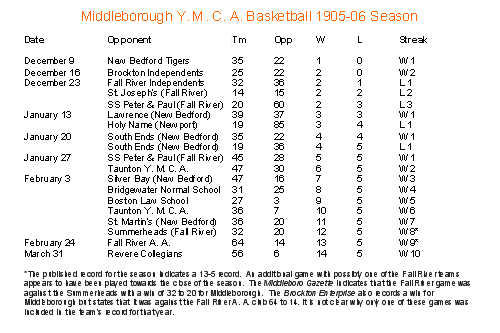 The 1905-06 season (13-5) was noteworthy in that the Middleborough Y. M. C. A. first team remained undefeated at home: “On the home floor they proved invincible.” Particularly remarkable was that following January 27 the team remained undefeated, winning ten games in a row, and achieving one of the best records of Middleborough teams during the era. The season opened December 9 with games scheduled weekly for the course of the winter, and the first team included some men from the 1904-05. No doubt the experience of the returning players was responsible for the remark made of the opening match between Middleborough and the New Bedford Tigers that “the game was played well for so early in the season” (though the following week’s game was lost to the Brockton Independents in overtime due to “poor team work”). Mel Gammons (lf, c), Lester Allen (lf), Chester Churchill (rf), “Dud” Pratt (c), Gordon Shurtleff (c), Harold S. Wood (rg), Elmer F. Gay (lg), Johnnie Morrison (lg) and George Carter played the majority of the games. Teams from New Bedford (Tigers, South Ends, Lawrence, Silver Bay) Fall River (Independents, SS Peter and Paul) and Brockton (Independents) were played. In addition to the Y. M. C. A.’s first team, there was a second team (for juniors), as well as a five-team league for juniors known as the Indian League, the names of each team representing a Native American tribe. The final standings in this league were Horicans (4-0), Navajos (3-1), Mohawks (2-2), Crows (1-3) and Blackfeet (0-4). “The excess money raised in basket ball will be devoted to enlarging the baths” at the Middleborough Y. M. C. A. Though the 1906-07 season featured 6 additional games beyond the previous year, initially there was difficulty lining up teams against which to play. “One of the Y. M. C. A. basket-ball teams outside of Boston that is making good is the Middleboro five, which at the first of the season had a rather difficult task of filling its schedule.” Though the season got off to a rough start with a number of losses, the local press thought otherwise, putting its own spin on the matter. “Games have been played with teams considered to be as fast as any on the independent teams in the game and [Middleborough has] won the majority of the games.” Most of the team – Gammons, Churchill, Allen, Carter, Wood and Gay had played the previous season and brought strength to the team. Despite the team’s opening 29-34 loss at the start of the season to the South Ends of New Bedford, the Middleboro Gazette was confident of a successful season. “Though they were the losers, experts who saw the game claim that defeat by such a close score after the great game they played is not to be looked upon as at all disappointing.” Interestingly, the team to which they lost – the South Ends – had been accused by the same newspaper only a year and a half earlier of looking as if they had practiced in a barn. Gammons and Allen “Middleboro’s old standbys for goal shooting” scored 20 of the team’s 29 points, with Churchill contributing an additional six. While offensive and defensive work both “showed up well”, lack of practice was noticeable. The team’s second loss (19-31) came at the hands of the Boy’s Club of Fall River, a number of whose players had played the previous year on the SS. Peter and Paul team with which Middleborough had split two games. The Gazette attributed the loss to the absence of Gammons. “The remaining members worked hard together and fought to stem the tide of rapidly piling baskets, but the Fall River team seemed to shoot accurately, and the ball dropped time and time again into the basket.” While Middleborough’s pass work had improved as evidenced by the game, shooting was lackluster. “Unfortunate throws for baskets however, made it impossible for them to get the score up to a point where it would meet that of their antagonists.” Again, lack of practice was evident and the team proposed additional work over the course of the subsequent week. Apparently, the extra practice paid off for on December 8 the team won its first game of the season in a decisive match-up against Co G of New Bedford. Middleborough easily ran up the score through the first half, leading 26-4 at half-time. Middleborough was both fast and accurate in their shooting, piling up the points, while the New Bedfords were hampered by poor shooting, narrowly missing on all but two shots. New Bedford pulled itself together for the second half however, making good on most of its attempts and outscoring Middleborough 26 to 25. Unfortunately for that team, the first half had been so dismal that they were not able to overcome Middleborough’s early lead. Pass work on the part of Middleborough was “especially brilliant” with the team showing a marked development since their last outing, “the back shooting figuring largely in getting the ball in shape for good plays.” Gammons contributed 17 points, Allen 12 and Churchill 8. Early January brought a string of three victories over Y M. C. A. teams from Abington, Fall River and Everett. The January 5 game against Abington was noted for its purity. The admirers of basket ball played according to rule, clean and fast, got the simon pure article Saturday night ….The game was one of the exceptionally fast ones played this year, lacking the spirit of roughness, and for this reason the spectators have a considerable kindly feeling towards the Abington boys. In early February, Middleborough hosted the South Ends of New Bedford, a traditionally rough-playing team. Not surprisingly, the game proved “one of the wildest ever played here…. The scrappy feature of the game developed more especially in the final period, when there was one good sized row, in which several of the players and a few spectators mixed faces and fists, though none of the participants received injuries.” Middleborough lost 21-26 and Lester Allen was the team’s leading scorer with 8 points. The following two games against the Melrose Y. M. C. A. on February 16 and the Lawrence Club of Fall River on February 23 were high scoring affairs for Middleborough. Following the tightly contested back and forth scoring of the first half of the Melrose game, Middleborough outdistanced the visiting team in the second half to win 49-26, with Gammons scoring 20 points and Allen 16. Allen scored 20 points in the following week’s match-up with the Lawrence Club, and though Middleborough rallied hard and closed a 12-point deficit in the second half, it fell short, losing 32-34. During the game Chester Churchill was injured in what the Middleboro Gazette described as a “melee” and was substituted for by Rodney McDonald. Middleborough fans were treated to a “scientifically played” game between the home team and the Brown A. A. club on March 16. The teams were well-matched, and Middleborough led after the half, 20-18. Brown, however, was able to surge in the final half, winning 33-30. The season concluded in April and Middleborough once more had outscored its opponents 822 to 614. “Gammons had the best personal record, with 289 points, Allen came next with 232 and Churchill had 202. Gammons made 51 goals on fouls and 119 from the floor.” Other members of the team in 1906-07 included Harold S. Wood, George Carter, Elmer Gay, Ralph Kelley, W. W. Hall, Charles Sherman and Roderick ("Rodney") McDonald. During the season, the Y. M. C. A. also sponsored a five-team junior league. Team names (Assawampsett, Quitticus, Pocksha, Snipatuit and Tispaquin) were taken from the nearby lakes in the region. The starters for the Y. M. C. A. first team for this season were Gammons, Churchill, Rodney McDonald, Kelley and Gay, and once again the team made an early strong showing on the home court in the former Peirce Academy building, demonstrating much of the same skill seen at the end of the previous season. A strong passing game was the key to Middleborough’s success: “The ball went about where they willed it, and only occasionally did the visitors get a look in.” Yet despite this strong start, the 1907-08 season would prove Middleborough’s first losing season in a number of years. The season was launched with a string of four victories over Y. M. C. A. teams from Abington (52-24), Everett (65-14) and Fall River (38-18) and the South Ends of New Bedford (31-26). The New Bedford game was particularly rowdy and was noted for “considerable scrapping in the game and Gay and West mixed it up to such an extent that they were both ruled off the floor.” The Middleborough Y had no substitute for Gay and though forced to play with only four – Churchill, Gammons, McDonald and Kelley – it still won. As usual, New Bedford was accompanied by a large contingent of avid fans and many of those found fault with the officiating of Will Crapo of Middleboro. “The visitors made frequent objections to the decisions of referee Crapo and on several occasions voiced them emphatically only to have fouls called on them. They alleged discrimination was shown by the officials of the game.” The challenge of the New Bedford game notwithstanding, the blazing start to which the team got off to prompted many to predict a winning season. “It’s getting to be a case of a sure thing for the Y. M. C. A. basket ball team, that of winning games from all comers,” wrote the Middleboro Gazette following the team’s fourth win. The local newspaper wrote too soon, for on December 19, the Middleborough team lost to the Bosworths of New Bedford 33 to 58, and would drop the subsequent four games to the Bristol Y. M. C. A., Lawrence Club of Fall River, Abington Y. M. C. A. and the Centrals of Dorchester. Following the team’s fourth consecutive loss, Mel Gammons withdrew from the team in order to rest, an indication perhaps as to why the team in late December and early January was not performing at its previous level. The result of the December 21 game against the Y. M. C. A. team from Bristol, Rhode Island, in Middleborough ended in dispute as a consequence of a time-keeping error. While one timekeeper called the game with Bristol leading 29 to 27, the other timekeeper maintained that 10 seconds remained in the game. The players on the home team, as well as the spectators, refused to stand for the unofficial timer’s statement, and the spectators swarmed on the floor and for a few minutes it looked as though a fight would ensue. The trouble really started between Herrmann of the visiting delegation and Churchill of the home team, who had a little mixup, which was quickly stopped by the other members of the teams. When the two teams failed to reach an agreement regarding the outcome, the game was called off. Gammons returned temporarily to the team of January 18, seemingly refreshed, and helped the team win its first game since December 7. Also returning were Harold Wood and Rodney McDonald who had played only intermittently in the previous games. “… The attendants were glad to welcome into the game some of the old stars who have recently laid off”, especially given that they provided a well-needed win over the Fall River Naval Reserves who had been pegged as the favorites. The remainder of the season proved a mixed bag for the team, which alternated wins with losses. On January 22, the Middleborough team lost 17 to 36 to the Bristol Y. M. C. A. which was no doubt well satisfied with the win given the dispute surrounding the previous meeting of the two teams in December. The following week, Middleborough trampled the Revere A. A. team, its 53-10 win coming as a “cinch”. Strong offense and a strong blocking game on the part of the Taunton Independent team on January 31 helped shut down Middleborough which lost 29 to 42. An extremely fast-paced game against the Summerfield team of Fall River on February 8, however, saw the Middleborough squad edge out the team from the spindle city, 24-21. The game was extremely hard fought. The ball was nearly in continuous play and the men were exhausted at the conclusion. “The men played to their limit and it was certainly the fastest game of the season…. It was evidently a case of players being so rattled that they could not show best results.” In this game, Middleborough had only four starters arrive and so had to call in manager Charles A. Sherman as a substitute at left guard. McDonald’s game against the Newton Y. M. C. A. the following week, however, was noticeably rough, and the fighting during the game was attributed to him. The game was clean throughout, except differences in which McDonald figured prominently, and he participated in several scuffles. The spectators in general regretted the continued breach of basket ball etiquette for which they believe he was responsible, and which led to his being ruled from the floor. While Middleborough’s two guards performed well in the game, they could not prevent an “avalanche” of Newton baskets. Following a Middleborough win over the Fall River Y. M. I. C. on February 22, the Leap Year night game against the Summerfields of Fall River looked as well as if it might go in the other direction. Unlike other teams, the Summerfields were relatively well acquainted with the Peirce Academy gymnasium and were an even match for the Middleborough Y. At the end of the official 40-minute game, the score stood tied at 33 all and an extra period was agreed upon. “…In about 30 seconds Churchill aimed a well directed throw toward the basket. It was successful and he won the game, 35 to 33” for Middleborough. The game was also noteworthy in that it marked the officiating debut of W. Smethurst, the local Y’s physical director from 1906-09 and coach of the Middleborough High School team. On March 7, the Middleborough Y. M. C. A. team succumbed to the Rhode Island champion Newport Tigers which “took the pelt from the local team”, 19 to 43. Churchill, who was having a banner season, along with Gammons were the leading scorers. A scheduled game against the Melrose A. A. on March 14 not only failed to come off, but the controversy surrounding it created friction within the Middleborough organization. Arriving with only four members of his team (the fifth missed the train), Melrose manager Doherty requested that a local player be substituted and W. W. Hall was tapped to fill this role. The local Y. M. C. A. as a matter of principle, however, refused to pay Doherty the standard $10 guarantee as his team had failed to show in its entirety. The differences could not be arbitrated, so the visitors dressed and returned home without getting their guarantee. Several spectators without a full knowledge of the facts felt that the visitors had not been used rightly, and said so, and Harold Wood of the Middleboro team resigned. The whole affair was unfortunate. Secretary Coburn said this week if there must be trouble over basket ball the Association may eliminate it entirely, for they do not intend to have these mix-ups just for the sake of maintaining a basket ball team. The final game of the season was played April 4, 1908, against Company F of Fall River. “The game was well played, though there were many fouls, and the least bit of roughness. The boys could be excused for this though, as the game was played very fast and some pretty shots were made.” The Fall River team won 41 to 37. The season commenced with a practice the first week of November, 1908. Returning players from the previous season were Rodney McDonald, Morton Marshall, Harold S. Wood, Elmer F. Gay, Chester B. Churchill, Bradford Swift and Ralph Kelley. Churchill was named captain and Wood served as the team manager. Many of the members, including Gammons, Allen, Wood, Swift were members of the Middleborough High School team. One of the most exciting games, strictly from the point of view of game play, was the late December match up against the Taunton Y. M. C. A. After the second half, the game was tied 26 all, and Middleborough won 36-31 in a dramatic five-minute overtime. More exciting for the spectacle of the entire evening was the dramatic game of January 23, 1909, which saw the cancellation of the game following the “rumpus” which saw 200 spectators flood the floor. While General Secretary Carter wrote in his annual report for 1909 that “Basket ball continues to have an important place in our line of sports under the efficient leadership of Mr. C. A. Sherman”, other organizations were beginning to develop teams of their own and compete with the Y. M. C. A. for the attentions of local basketball enthusiasts. Locally, it was Middleborough High School students in the late 19th century who were largely responsible for the introduction of football into the community as an organized sport, so it is somewhat surprising that students there did not take a similar role regarding basketball. However, the school’s students of the 1890s and early 1900s, though interested in basketball, were like the early Y. M. C. A. hampered by the lack of a suitable venue for playing the sport. The Middleborough High School building (later the Bates School) was built in 1886 without a gymnasium, and so while both football and baseball could be played by high school students at relatively little expense beyond the basic equipment, basketball which required an indoor court could not. 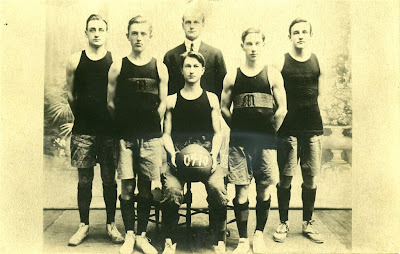 As a result, many high school age boys tended to participate in basketball under the auspices of the local Y. M. C. A. rather than form their own school team. This changed however in late 1904, when high school students Wales Andrews, Arthur Swift and Kenneth Childs were named by the High School Athletic Association as a committee to establish a basketball team at the school, with class teams and one representing the entire school being proposed. The result was the formation of a team in early 1905 consisting of Childs (rg), Mel Gammons (lf), Gordon Shurtleff (c), Lester Allen (rf) and Harold Wood (lg). Home games were played in the Y. M. C. A. gymnasium on Center Street which became the high school’s home court. One of the speediest basket-ball teams in this section …it has met Taunton high, New Bedford high, Mansfield high and defeated them. The local Y. M. C. A. team has once defeated them in a practice game. Much of the team’s ability was attributable to the experience which its members had garnered with the local Y. M. C. A. teams. 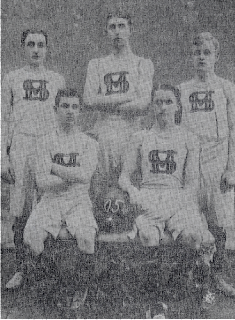 Ultimately, beginning with the 1905-06 season, it would be the Middleborough High School students - particularly Gammons, Allen and Wood - who would form the backbone of the Y. M. C. A. teams through 1909. The school’s team for 1907-08 featured J. Stearns Cushing (rf and captain), Everett LeBaron (lf), Williams (c and manager), Brad Swift (rg), Jones (lg), Russ Murray, Albert Alden and Daniel Besse. The team played a 14-game schedule during the first months of 1908, meeting the high school teams from Woonsocket, Taunton, Fairhaven, New Bedford, Canton, Quincy, Cottage City, and Bridgewater, as well as Tabor Acdemy. Though teams existed prior to 1909, the high school, team for that year was described as “practically the first venture of a High school organization in this sport here.” Consisting of Gammons at left forward, Everett LeBaron at right forward, Cushing (who also acted as manager) at center, George Jones at right guard, Besse at left guard and substitute Ralph Mendall, the team was known as the Middleborough Students and finished with a 9-4 record. Gammons was largely responsible for both the formation and development of the team. “…Through his coaching the team was so developed that it was considered the best passing combination ever in town.” The team played high school teams from Bridgewater, Taunton, Provincetown, East Bridgewater, Brockton and New Bedford, with its losses coming at the hands of the last two larger schools. 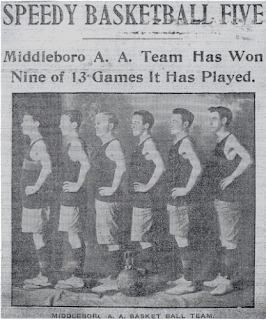 Also in 1909, a new independent team known as the Middleboro Athletics was established by the Middleborough Athletic Association and played its games in a new venue – Middleborough Town Hall. Teams independent of the Y. M. C. A. organization were proposed at least as early as 1902 in Middleborough when boys at North Middleborough proposed establishing a team there, “provided that they can secure a suitable place to practice in.” Nothing appears to have come of this proposal and the local Y. M. C. A. continued to dominate basketball. On November 15, 1909, the first basketball game ever played in Middleborough Town Hall took place between the Middleborough A. A. team and the Bridgewater Independents. The Town Hall was an improvement upon all previous locations in Middleborough, including the Peirce Academy gym as it was the first locale which provided sufficient space about the perimeter of the court. It was the first game … in town played under conditions with enough room to satisfactorily handle the ball. This feature made the game doubly interesting for there was plenty of fine pass work on both teams, and the larger floor space made much prettier playing. At either side of the hall baskets were erected, and the spectators were gathered in the gallery, on the stage and about the hall …. To help attract patrons to the games, the team sponsored post-game dances and “this has proven an attractive feature”, according to a press report from February, 1910. Clearly alternatives to Y. M. C. A. basketball were emerging in Middleborough, and the organization’s one time dominance of the local sport was rapidly becoming a thing of the past. Still, the Y. M. C. A. teams would remain popular for several more years, and the Y would remain significant in providing the venue for the community’s games. In 1913, a new Y. M. C. A. building with a thoroughly modern gymnasium for basketball opened on North Main Street. In the basement will be the gym. It will be 40 x 56 feet and 20 feet high. On the ground floor, surrounding it, will be galleries for spectators to witness the floor work and the basket ball games. The galleries will be eight feet above the gym floor. This site remained Middleborough’s principal basketball venue until the construction of Middleborough Memorial High School in 1927, also on North Main Street. By that time, however, the local game had developed substantially, and several teams unaffiliated with the Y. M. C. A. had been established. No longer would the Y. M. C. A. dominate the sport it had done so much to create and to foster. Thatcher Block, Center Street, Middleborough, MA, photograph, late 1890s. This view depicts the large wood-frame Thatcher Block at the corner of Center Street and Thatcher’s Row. In 1896, the Middleborough Y. M. C. A. located to the building’s second floor which included a hall which had once been used by the Sons of Temperance and which the Y made over into a gymnasium. It was here that the first formally organized games of basketball in Middleborough are believed to have been played. Y. M. C. A. Letterhead, c. 1903-04. The organization’s letterhead from shortly after the turn of the century outlines the Y. M. C. A.’s mission at the time. Basketball would be a part of it. “Y. M. C. A. 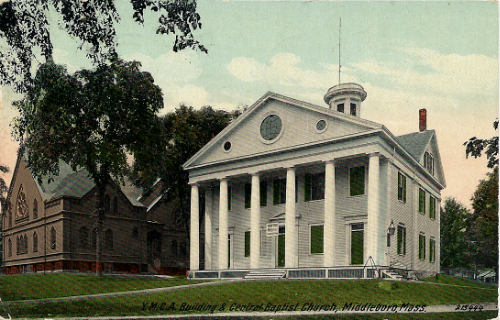 Building and Central Baptist Church, Middleboro, Mass.”, Leighton & Valentine, picture postcard, c. 1905. Depicted in this lithochrome postcard from the turn of the last century is the former Peirce Academy building which stood on the site now occupied by the Middleborough Post Office. The ground floor of the Academy building was occupied between 1898 and 1912 by the gymnasium of the local Y. M. C. A.
William H. Crapo, photographic half-tone from an original photograph, 1905. Chester B. Churchill, photographic half-tone from an original photograph, published in the Brockton Enterprise, “Has Good Prospects”, December 5, 1908. First YMCA Basketball team, Middleborough, MA, photographic half-tone from an original photograph, 1896, published in the Middleboro Gazette, Old Middleborough, March 4, 1927, page 1. Left to right, standing: Herbert A. Pratt, general secretary A. E. Roberts, Albion W. Merritt, George L. Thomas; sitting: Charles A. Sherman, William H. Crapo, Will C. Phinney. The members wear jerseys bearing the YMCA’s triangle logo with an “M” for Middleborough in the center. Black Knights Y. M. C. A. Basketball Team, Middleborough, MA, photographic half-tone from an original photograph, published in the Brockton Enterprise, “Only Four Teams Beat Them”, April 21, 1904. Standing, left to right: Al Sparrow, Carlton White, Clif Berry; seated: Melvern Gammons (captain), Gordon Alden, Chester Churchill (manager). Middleborough Y. M. C. A. First Team 1905-06 Season, photograph, c. 1905. Standing, left to right: Manager Charles A. Sherman, Y. M. C. A. General Secrtary J. C. Coburn; seated: Lester Allen, Elmer Gay, Melvern Gammons, Chester Churchill, George Carter; reclining: Harold S. Wood. Middleborough Y. M. C. A. First Team 1906-07 Season, photographic half-tone from an original photograph, published in the Middleboro Gazette, April 12, 1907, page 2. Standing, left to right: Lester Allen, Manager Charles A. Sherman, Harold S. Wood; seated: Roderick McDonald, Captain Melvern Gammons, Chester Churchill. Middleborough Y. M. C. A. First Team 1907-08, photograph, c. 1907. Middleborough High School Basketball Team, 1905, photographic half-tone from an original photograph, published in the Brockton Enterprise, “Has a Strong Team”, March 1, 1905. Middleborough A. A. Basketball Team, Middleborough, MA, photographic half-tone from an original photograph, published in the Brockton Enterprise, “Speedy Basketball Five”, February 17, 1910. Middleborough A. A. 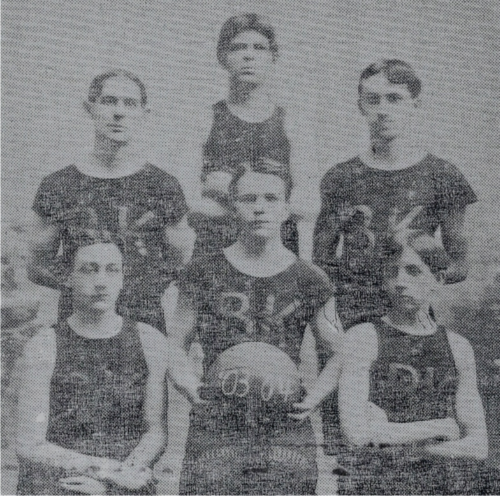 Basketball Team, photograph, c. 1909. Gulick, Luther, ed. Official Basket Ball Rules. New York, NY: American Sports Publishing Company, 1897. Gulick was the director of the International YMCA Training School at Springfield, and it was at his request for an active indoor game that led Naismith to develop basketball. Naismith, James. Rules for Basket Ball. Springfield, MA: Springfield Printing and Binding Company, 1892. Brockton Enterprise, “Surprise at Middleboro”, mid-March, 1903; “Whitmans at Middleboro”, March, 1903; “Fast at Middleboro”, mid-March, 1903; “Bangors Again Lose”, March, 1903; “Battery I Beaten”, early 1903; Brockton Enterprise, “Victors 22, Middleboro Y. M. C. A. 17”, December 20, 1903; “Brockton H. 23, Middleboro YMCA 12”, December 27, 1903; Brockton Enterprise, “Middleboro Y. M. C. A. 2d Wins”, January 17, 1904; “Middleboro B. K. 15, Taunton H. S. 8”, January 23, 1904, “Middleboro YMCA 25, Taunton AA 12”, January 24, 1904; “Middleboro Y. M. C. A. 41, Eagles 6”, January 31, 1904; “Whitman 26, Middleboro 20”, February 27, 1904; “Ames H. 21, Middleboro Y. M. C. A. 20”, March 13, 1904; “St. Martin’s 31, Middleboro 24”, March 27, 1904; “Two Games in Middleboro”, April 3, 1904; “Only Four Teams Beat Them”, April 21, 1904; “Middleboro 40, Eagles 9”, December 4, 1904; “Middleboro 23, Lawrence 19”, December 11, 1904; “Brockton Boys Beaten”, December 18, 1904; “Two Good Games at Middleboro”, January 1, 1905; “Middleboro 27, Fall River Tigers 25”, January 8, 1905; “Middleboro 25, South Ends 10”, January 15, 1905; “Middleboro 34, Marion 9”, January 22, 1905; “St. Joseph 21, Middleboro 19”, January 29, 1905; “Boston 30, Middleboro 6”, February 5, 1905; “Middleboro Wins at Basket Ball”, February 8, 1905; February 12, 1905, “T. Y. M. C. A. 13, Middleboro 11”; “M. Y. M. C. A. 37, M. H. S. 10”, February 19, 1905; “Second Team 16, First Team 14”, February 26, 1905; “Middleboro 36, Co G 17”, March 5, 1905; “M. Y. M. C. A. Tigers 31, Battery I 16”, March 19, 1905; “Middleboro 22, P. Y. M. C. A. 9”, March 26, 1905; “F. R. S. C. 42, M. Y. M. C. A. 27”, March 30, 1905; “Brockton 32, Y. M. C. A. 24”, April 16, 1905; December 3, 1905; “Middleboro 35, Tigers 22”, December 10, 1905; “Brockton Ind. 25, Middleboro 22”, December 17, 1905; “Fall River Ind. 36, M. Y. M. C. A. 32”, December 24, 1905; “Middleboro 39, Lawrence Club 37”, January 14, 1906; “Middleboro 35, South Ends 22”, January 21, 1906; “Middleboro Y. M. C. A. 45, SS Peter and Paul 28”, January 28, 1906; “In the Indian Series”, January 28, 1906; “M. Y. M. C. A. 47, Silver Bay 16”, February 4, 1906; “In Indian Basket-Ball League”, February 19, 1906; “Basket Ball at Middleboro”, February 23, 1906; “Middleboro 64, Fall River 14”, February 25, 1906; “Middleboro 56, Revere Col. 6”, April 1, 1906; “Wins 13 Out of 18 Games”, April 2, 1906; “Middleboro”, April 10, 1906; “Wants Few More Games”, January 3, 1907; “Middleboro”, April 5, 1907; “Middleboro Y. M. C. A. 38, Fall River 18”, December 1, 1907; “N. Y. M. C. A. 31, South Ends 26” [sic], December 8, 1907; “Game Ends in Dispute”, December 22, 1907; “Lawrence 51, Middleboro 43”, December 29, 1907; “Middleboro H. S. 41, Tabor Acad. 11”, January 10, 1908; “Basket-Ball Contests”, January 10, 1908; “Middleboro Y. M. C. A. 56, N. R. 34”, January 19, 1908; “Middleboro Y. M. C. A. 53, R. A. C. 10”, January 26, 1908; “Canton A. A. 42, Middleboro 29”, February 2, 1908; “Middleboro 24, Summerfield 21”, February 9, 1908; “Newton Y. M. C. A. 35, Middleboro 23”, February 16, 1908; “F. R. Y. M. I. C. 34, M. Y. M. C. A. 25”, February 22, 1908; “Middleboro 35, Sommersworth 33”, March 1, 1908; “Newport and Boston Teams Win”, March 8, 1908; “Taunton Ind. 31, M. Y. M. C. A. 29”, March 22, 1908; “Good Interest Shown”, November 10, 1908; “Has Good Prospects”, December 5, 1908; “Cambridge 56, Middleboro 20”, December 26, 1908; “Middleboro Y. M. C. A. 36, Taunton 31”, December 27, 1908; “Players Come to Blows”, January 24, 1909; “Crowd Went on the Floor”, February 14, 1909; “Middleboro Y. M. C. A. 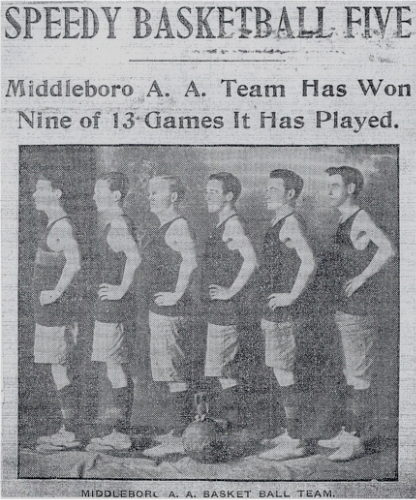 37, Co G 12”, February 27, 1909; “Lawrence Club Won, 49 to 36”, March 14, 1909; “Middleboro Y. M. C. A. 38, Franklin 9”, March 17, 1909; “Gammons Enters Denial”, January 28, 1910’ “Speedy basketball Five”, February 17, 1910; “Pioneer Days of Basketball in M’boro Bring Fond Memories”, April 3, 1954. “Committee of Forty on the Warpath for New Members Before Oct. 1”. Middleborough Y. M. C. A. Unpublished manuscript. Middleborough Historical Association. General Secretary’s Report for 1909: Middleboro, Mass. Middleborough Y. M. C. A. Unpublished manuscript. Middleborough Historical Association. Howard, David B. Brief History of the Early Days of the Young Men’s Christian Association of Middleboro, Massachusetts. Unpublished program, Recognition Dinner to the Founders, Middleborough Y. M. C. A., Middleborough, MA, November 13, 1933. Middleborough Historical Association.